Leopoldo Cuspinera Madrigal is a Mexican artist, architect, and academic. He holds a B.A. in Architecture from the UPAEP University in Mexico; Certificate in Sacred Art and Architecture from the Pontifical Gregorian University in Rome, Italy; Certificate in Theology from the Iberoamericana University in Mexico; Master Degrees in Management and Enhancement of the Cultural Heritage from The Sorbonne University in Paris, University of Evora in Portugal, and University of Padua in Italy. “In my role as a conservator, I work to understand and respect the natural and cultural legacy and go beyond its utilitarian qualities. I also produce and promote new works that demonstrate both evolution and continuity based on pre-existing tangible and intangible heritage”. Cuspinera Madrigal has exhibited extensively throughout Mexico, the United States, Italy, France, and Switzerland. He has been commissioned for important artistic, architectural, and large-scale religious works in Puebla, Mexico; Rome, Italy; and Houston, Texas. He currently lives in Santa Fe, New Mexico. “For more than twenty-five years I have been focused on the dynamic relationship between landscape and memory. I think because I do not want to lose my own memory, I use many objects to trigger it. I have taken what is already there, in different places, and I transform it. In this way, I give the landscape back what it has given me and what I need to remember”. “My depictions function as memorial artifacts, in some way they show veiled and unveiled segments of reality. These segments permit me to observe details which otherwise would be lost in the immensity”. “Because of the nature of the technique used, the form emerges from the material itself and the representations radiate an ethereal quality. The technique is based on pre-Columbian paper fabrication: the Mexican Papel Amate. 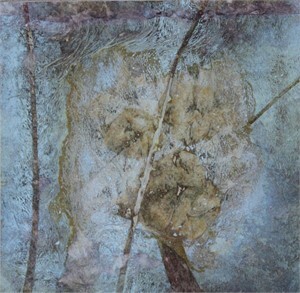 I have transformed that technique by adding resins and other materials such as recycled paper pulp, oils, chalk, charcoal, gold, silver, and bronze”. “The paintings are attempts to depict, more than landscapes, the past, present, and future spirit of place, in a single moment. As humans continue to plunge into the future, the land is depicted as an immense keeper, as a memorial even, sometimes confronting less than hospitable terrains, ghosts of man-made traces, footprints, and architectural past”. 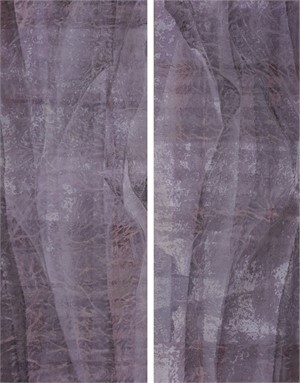 Leopoldo Cuspinera combines processes from two ancient techniques: the Mexican papel amate and the Japanese washi sokei. Over a 25-year period, Cuspinera has adapted aspects from each and added his inventions to them; using paper insertion, collage and paper mache. I am constantly mixing and refining these processes. 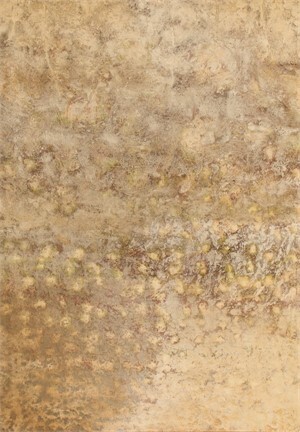 Incorporating resins, oils, chalks, pigments and other materials. For conservation purposes, Cuspinera maintains a neutral PH in his materials. Viewing a finished artwork, you will notice a captivating ethereal quality; studying it, you will find a landscape embedded in a textural ground and appreciating it you will see a mature palette portraying the earth. A unique combination of techniques, both old and invented sets Cuspinera apart in the contemporary art field. Leopoldo Cuspinera Madrigal is a Mexican artist, architect, and academic. He holds a B.A. in Architecture from the UPAEP University in Mexico; Certificate in Sacred Art and Architecture from the Pontifical Gregorian University in Rome, Italy; Certificate in Theology from the Iberoamericana University in Mexico; Master Degrees in Management and Enhancement of the Cultural Heritage from The Sorbonne University in Paris, University of Evora in Portugal, and University of Padua in Italy. “In my role as a conservator, I work to understand and respect the natural and cultural legacy and go beyond its utilitarian qualities. I also produce and promote new works that demonstrate both evolution and continuity based on pre-existing tangible and intangible heritage”. Cuspinera Madrigal has exhibited extensively throughout Mexico, the United States, Italy, France, and Switzerland. He has been commissioned for important artistic, architectural, and large-scale religious works in Puebla, Mexico; Rome, Italy; and Houston, Texas. He currently lives in Santa Fe, New Mexico. “For more than twenty-five years I have been focused on the dynamic relationship between landscape and memory. I think because I do not want to lose my own memory, I use many objects to trigger it. I have taken what is already there, in different places, and I transform it. In this way, I give the landscape back what it has given me and what I need to remember”. “My depictions function as memorial artifacts, in some way they show veiled and unveiled segments of reality. These segments permit me to observe details which otherwise would be lost in the immensity”. “Because of the nature of the technique used, the form emerges from the material itself and the representations radiate an ethereal quality. The technique is based on pre-Columbian paper fabrication: the Mexican Papel Amate. I have transformed that technique by adding resins and other materials such as recycled paper pulp, oils, chalk, charcoal, gold, silver, and bronze”. “The paintings are attempts to depict, more than landscapes, the past, present, and future spirit of place, in a single moment. As humans continue to plunge into the future, the land is depicted as an immense keeper, as a memorial even, sometimes confronting less than hospitable terrains, ghosts of man-made traces, footprints, and architectural past”. 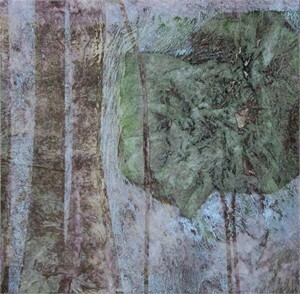 Leopoldo Cuspinera combines processes from two ancient techniques: the Mexican papel amate and the Japanese washi sokei. Over a 25-year period, Cuspinera has adapted aspects from each and added his inventions to them; using paper insertion, collage and paper mache. I am constantly mixing and refining these processes. 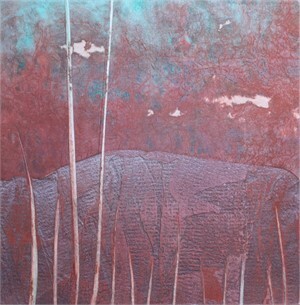 Incorporating resins, oils, chalks, pigments and other materials. For conservation purposes, Cuspinera maintains a neutral PH in his materials. Viewing a finished artwork, you will notice a captivating ethereal quality; studying it, you will find a landscape embedded in a textural ground and appreciating it you will see a mature palette portraying the earth. A unique combination of techniques, both old and invented sets Cuspinera apart in the contemporary art field.